June 28 is a great day in the history of my State of South Carolina and in the formation of our great Nation. You see, it is on this date that we celebrate Carolina Day. Two hundred and thirty years ago today, a small but determined group of fewer than 1,200 South Carolina patriots held off a British force that was more than twice their size. The battle–which took place on Sullivan’s Island, just outside the entrance to Charleston Harbor–became the first major American victory of the Revolutionary War. Colonel William Moultrie, who commanded the colonial troops, had few resources at his disposal. So, he built a fort out of palmetto logs–a plentiful local resource. Facing such make-shift opposition, the British commanders thought they would easily sweep into Charleston. But these amazing palmetto logs actually absorbed the impact of the British cannonballs. This strengthened the American defense and gave the brave colonists a critical advantage. The British were soundly defeated in a long, nine-hour battle. More than 200 of the British were killed or wounded, compared to only 35 of Colonel Moultrie’s command. Many historians consider this battle to be one of the greatest defeats in the entire history of the British navy. Many South Carolina heroes were made on that day. Sergeant Jasper then jumped into the face of enemy fire, walked the entire length of the fort–in full view of the British and cut the flag from its broken pole. He then added a new staff and replanted the flag back on the fort wall. Turning to the enemy, he gave three cheers and returned to his gun. That flag–a blue banner with a white crescent–represented the dream of real freedom to these patriots. And today, that historic banner still serves as a source of pride and inspiration, as part of South Carolina’s official State seal. 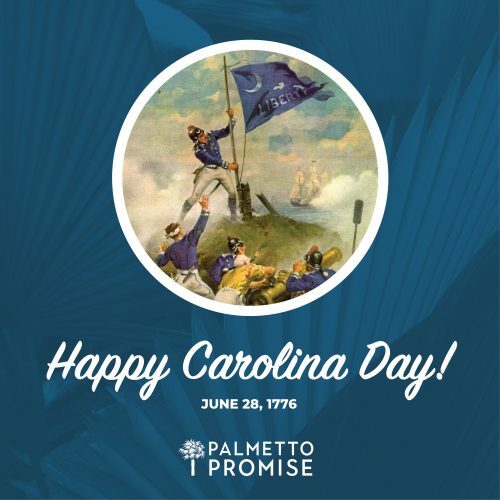 The blue background and white crescent also serve as the basis of our beautiful State flag, which incorporates a tall, proud palmetto tree … in recognition of the heroes of Fort Moultrie. As we celebrate Independence Day with friends and family, may we always remember the price that was paid for our freedom.